If you had to stand in front of crowds and do public speaking how would you feel? If you knew to get to the top you had to overcome your greatest fears would you fight through them? Life can bring many knocks and falls, what would be your coping technique? If you wanted something outrageously how hard would you fight for it? Do you often tell people how you really feel? 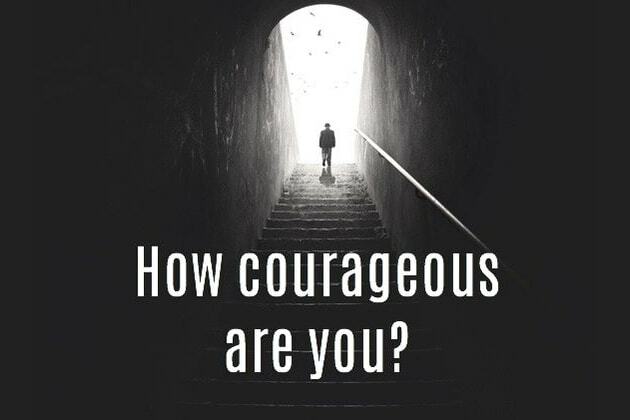 Would you consider yourself courageous? You are a concrete courageous soul! Life has made you strong and you can easily make difficult decisions. You are fully in-tune with your intuition and you are full of courage that means you are always willing to take that big leap! You have difficulty finding courage but when you have it you really know how to follow your instinct. You will stand on the solid rock until the courageous beast inside you roars and tells you to jump into the unknown. You are a calmly courageous soul who will wait on the edge of the diving board until you are ready to jump. It might take you years but you have both feet firmly still on the diving board. Jumping takes risk and you are ready to take it when the time is right. You find it very hard to take that big jump but when you do you know it will be write. You often find it hard to listen to yourself and do what you believe in. Courage must first come from within and you still find it hard to find but don't worry we will all get there at some point. Would you take that extra risk? Perhaps do something others tell you not to? Pursue things new and exciting, even if they're out of your personality type?